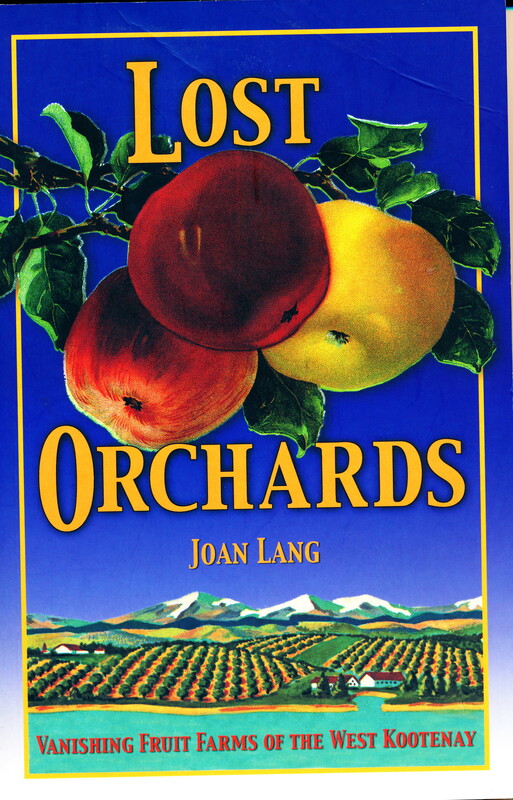 Lost orchards, vanishing fruit farms of the West Kootenays began as a thesis by Joan Lang in the History Department at The University of Victoria in 1996. It documents the development and decline of the fruit industry in the West Kootenays, an area that encompasses Nakusp, Kaslo, Nelson, Castlegar, Trail and Creston. It contains tables that list pre-emptions of land made between 1888 and 1904 in the region and statistics on fruit production from 1913 to 1934. The bibliography is comprehensive and the book is indexed. It is beautifully illustrated with maps and archival photos in both colour and black and white. The Kootenay region of British Columbia was marketed to many British residents through books like J.T. Bealby’s Fruit Ranching in British Columbia and many British citizens and others from the prairies came to pre-empt land and settle on acreages sometimes as small as 10 acres. They worked and learned together trying to make a viable and sustainable industry. The Doukhobors were a second group of migrants to settle in the area. They worked cooperatively and lived communally and also became fruit growers. The industry created by the settlers thrived for a short time. In 1920, Kootenay growers supplied 2/3 of the cherry crop in British Columbia. Strawberries and other small fruits grew abundantly. Jam factories were created and jam was shipped to the prairies and eastern provinces. The general economic decline of the 1930s severely impacted the struggling industry. The orchards were small compared to the larger ones developing in the Okanagan and the Okanagan had a warmer climate that was more supportive of fruit growth. Poor weather became a problem as did disease, pest infestations, and transportation. By 1950 the fruit industry of West Kootenay region had closed down. The next generation of the pioneering families moved on in pursuit of livelihoods in other sectors of the economy. The viable farming ventures of the early 1900s did not sustain themselves beyond 1950. Lang documents an industry cycle that causes one to wonder if it was doomed from the outset or were decisions made along the way that prevented it from thriving in the long term? And, in the long term does it matter? Traces of the industry remain and it makes me wonder if a resurgence or a new industry cycle might emerge again. 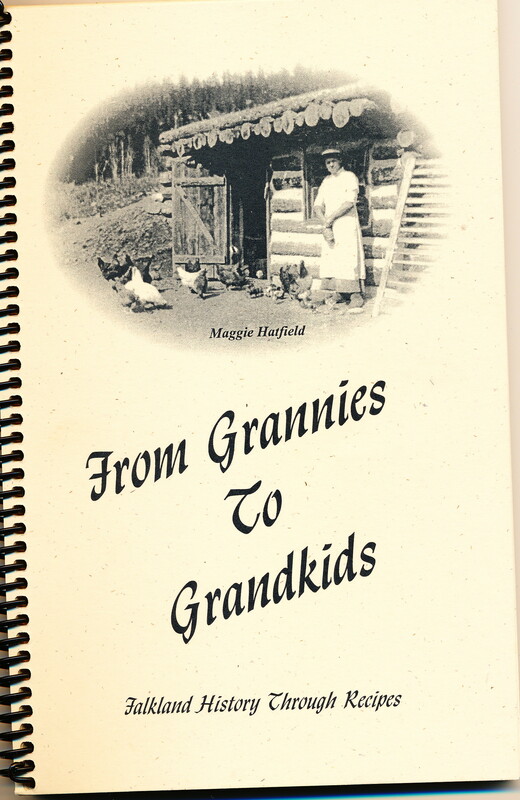 From Grannies to Grandkids, Falkland History through recipes is a charming little community cook book, coil-bound, 84 pages, 170 recipes and a combination of history, philosophy, poetry, photos, and food that conveys a picture of life in small town rural BC. It is organized into nine sections that provide an overview of the history of: The Postal Service, Courageous Pioneers, Valley Merchants, Canadian National Railroad, Gypsum Mine, Schools, The War Years, Churches, and Falkland Community. In closing, the authors note: “Some of the recipes sent in were written without methods, specific quantities of ingredients or were abbreviated in a unique way. We presented these recipes without changes, which we felt would add character to the recipes author” (p. 85). This book expects the user to have some knowledge of food preparation. For example a few recipes do not detail method of combining ingredients but simple state: “ Mix together like a cake.” There are no metric measures for recipes – Imperial only, and format for abbreviations varies. 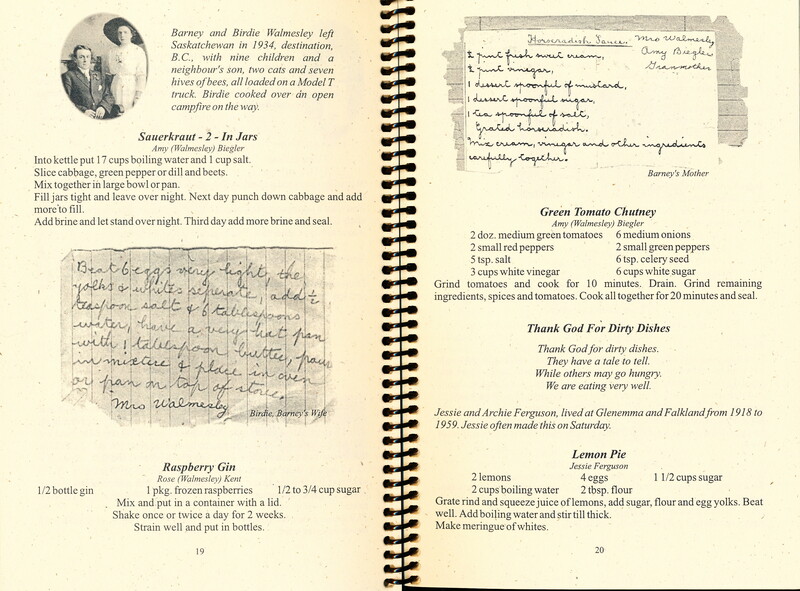 Contributors for all recipes are named and most are accompanied by stories. There is a vast range of and some rare and unusual recipes including the following: Baking Powder Bread, Oatmeal Water, Cake Doughnuts, Champagne, Haggis, Laxative, Exterior Wood Stain, Ginger Ale, Library Glue, Play Dough, Sweet Green Tomato Pickle, Pickled Chicken, and Coal Flowers. This is my go-to book for a recipe for Brownie Pudding, a comfort food from my childhood and still so delicious today! It’s like an inside out lava cake only better! You might find the recipe for Coal Flowers curious. Google claims they were invented by coal miners’ wives in the 1800s who had lots of coal and attempted to use it to create beautiful flower displays. The flowers are a result of a chemical reaction and crystal formation that grows from the coal. Mix together and pour over brick clinker or coal placed in a dish. Coat edges with Vaseline to prevent growth over the edges. Dab coal with coloured ink or food colouring. The recipes in this book suggest that most everything was home-made in early years and creativity with common ingredients was a way of life. Inventiveness and frugality were valued. This book would be strengthened if it had an index. One must thumb through all the pages to find the recipe you are searching for. The anecdotes and stories scattered throughout provide enjoyable reading. Published 20 years ago, this book may be difficult to find but it is possible that the Falkland Museum and Heritage Park still has copies. That is where I found my copy several years ago.